The other day we were in West Hollywood, walking after eating sushi at Jinpachi. I saw a frozen yogurt place and I said, “Oooh let’s get some frozen yogurt.” That’s not something I often say; in fact, I’m much more likely to say, “Oooh let’s get some ice cream.” Only, this being West Hollywood, ice cream isn’t really an option. Frozen yogurt is where it’s at because frozen yogurt, presumably, keeps everyone trim and muscular and sexually attractive. 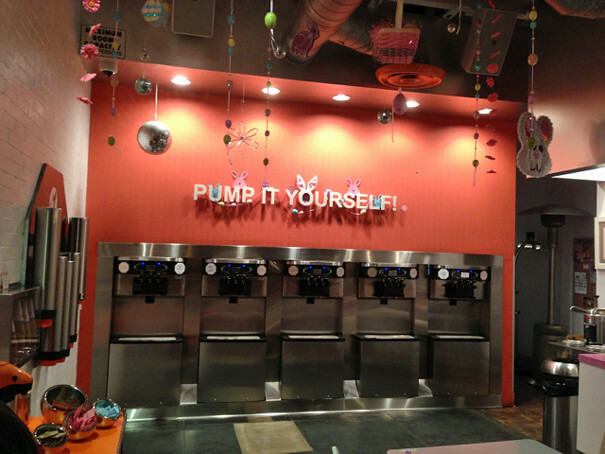 Then you go to a toppings bar that’s filled with Reese’s pieces, M&Ms, chocolate syrup, rainbow sprinkles, etc. As you can see from my lead photo, I went a little nuts with the toppings. And it occurred to me: this frozen yogurt with these toppings is probably worse for me than just eating ice cream. I know what you’re going to say. 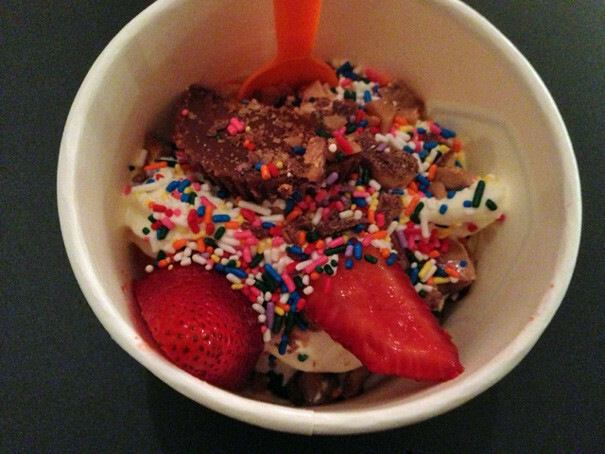 “You don’t have to put those toppings on top of your frozen yogurt.” True. But also: why do they have all of those toppings if you’re not supposed to put them on your frozen yogurt? And isn’t this some kind of psychological trick, luring you in with the promise of health but then sending you out the door with more candy in your cup than a movie theater concession stand? I’m not a nutritionist and I’m too lazy to do the math, but something tells me you’d be better off eating a scoop of ice cream than a mound of frozen yogurt covered in candy. The frozen yogurt biz is totally shady.